Your pet has gone missing. Mark pet as lost on pettouchid.com pet profile. Finder uses phone to scan, tap or visit website on the pet tag. They can view online cloud pet profile with owner contact info. Owner is contacted by finder. Automatic alert notifications sent out via email or owner can receive SMS detailing GPS map location of pet when scanned. Smart connected Pet ID tag, the modern way to succeed in finding your lost pet sooner. When pet tag ID scanned, GPS location is recorded with date and time. Privacy is important. You have full control and flexibility in choosing what information you are comfortable in sharing. Finder uses phone to access pet owner details, no visits to Vet for chip scanning. Notifications automatically sent out via email or SMS, showing GPS location of tag scanned. Detail important Health information, Registration, pet behaviour and your vet or providers details. Mark your pet profile as lost, add additional contact details, put a reward and Print/Send lost posters. Purchase a tag to benefit from the above FREE features. ID Tags: Do you need a smartphone for the tag to work? Pet Touch ID tags are unique in that you have many ways to identify the pet and owner. If the user doesn't have a smartphone they can browse the website on the tag via a tablet/computer. You can also SMS or Call our hotline number, linked with the pet profile. ID Tags: Are the tags country specific? You can use the tags anywhere Internationally. Currently the Pet Portal is only available in English. The aim is to be multi-lingual supported in the future. ID Tags: What is NFC? NFC is a contactless technology built into most mobile devices. This is the next generation of being able to interact with physical objects. Near Field Communication (NFC) is more convenient to access digital content through your device with a simple touch. ID Tags: What is a QR Code and how do you scan it? A QR (Quick Response) Code is a readable barcode by portable devices. QR Codes are a popular standard for fast reliable readability and greater storage capacity than standard barcodes. 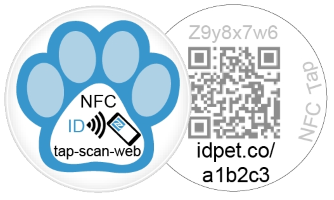 The Pet Touch ID QR Codes give a direct link to the owners Pet Profile. Scanning QR codes can be performed by any smartphone with a QR reader app installed. ID Tags: How robust are the tags? The Pet Touch ID Tags are designed for durability. We have different versions of tags - strong Epoxy, moulded Zinc Alloy surround with Epoxy center and Hard matt PVC tags. Online Service: How do I access and update my Pet Profile? Online Service: Is my information secure with privacy settings? Pet Touch ID platform runs on a secured cloud platform. All owner, pet and registration information is encrypted when transmitted using SSL (Secure Socket Layer). All sensitive data stored is also encrypted. Privacy is highly important, with Pet Touch ID the owner can control the information they wish to make available to the public via the Pet Public Webpage only. The owner can change these privacy settings anytime. Online Service: What privacy settings can I set? Owners can chose what information they are comfortable in sharing with the public from the Pet Public Webpage only. All other access to your information can only be done by the registered owner. Online Service: Does it cost anything to change pet information? The service is free. You have access to change any information 24/7 via the Pet Touch ID Portal. Online Service: Do I need to install an app on my phone to access the portal? No app is required. The need to install an app is seen as a barrier to access the Pet information easily. You can access the portal on any device by opening your preferred browser and navigating to https //portal.pettouchid.com or scan/nfc tap the tag. Online Service: Are there any subscription costs? There are no subscription costs. Purchase a Tag ID and receive free access to this online service at no additional cost. 3. Activate Tag, using the activation code on the tag and enter Pet Profile infomation. Thats it! Attach Tag to collar and you are all set. Registration: Can I register before I have my Tag ID? You can register your account and Owner information. Once you receive your tag you can complete the last step which is to activate the tag. Activation: How do I Activate multiple tags under same registration? In the portal Summary, there is an option to 'Activate Another Tag'. This will take you through the tag activation process you went through the first time. Once complete, you will now see 2 pets and their summary detailed in the Pet Touch ID Portal. Activation: Can I have multiple tags assigned to the same pet? This feature is currently under development. The alternative is to activate another tag under the same registration and duplicate the pet information. Notifications: How do I know notifications are working? We will shortly have a Service Status page. Until then you can always test periodically and scan your pet ID tag to ensure you receive an email notification and GPS location. Manage: What's the process to edit Pet information? Manage: How do you change Privacy settings? Privacy settings are split between Owner and Pets. Manage: Where is the Pet Page that anyone can view? Open the website URL on the tag in a browser from any device or computer. 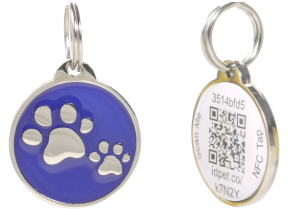 Purchase any Pet Touch ID tag, collar and have it shipped FREE of charge. Need help or have a question? Check out the FAQ section or click Contact Us. Ordered a new Tag? Get started with our Simple 3 Step Activation and Setup.